We brought our two top beer bracket finishers to Josh’s family Christmas party, where we managed to convince 10 of his relatives to taste the Great Lakes Christmas Ale and Thirsty Dog 12 Dogs in little dixie cups in a blind face off. We asked only one question: which cup of beer do you like better, the blue or the green? 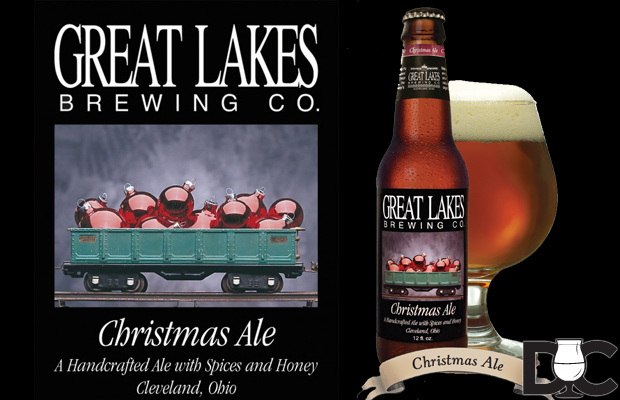 Word on the street is that Thirsty Dog’s brewer uses the original Great Lakes Christmas Ale recipe for the 12 Dogs, but I leave it to you to look that up and verify it. This is just a blog, not a beer Wiki. They are very similar beers, though, so I’ll give some credit to the claim. The title may have clued you in on the results: Great Lakes won 7 to 3. I like the face-off format, though the bracket was cumbersome and seems to have encouraged me to drink more Christmas beer than intended this year. We may limit the face-off to one round only, at least until we have a big crowd around to help with the drinking and judging! I ended up casting the deciding vote, and Great Lakes moves to the finals! Medium copper and very clear, with a thin, off-white head. Ginger and cinnamon on the smell and taste. Not as strong of a smell than the other beer. Lightly warming. Balanced sweetness with a drying finish. Very drinkable. Dark brown with ruby-red highlights. Clear, as far as I can tell, with a thick, tan head. Lightly warming. Medium body and carbonation. I don’t know that I’d want to drink more than one of these in a sitting, but this is a really nice beer. Josh and I held the first semifinal match blind, but short of putting the beers themselves in opaque glasses and closing our eyes while we drank them, it was hard to call this a blind tasting while viewing the two contenders – Thirsty Dog’s 12 Dogs of Christmas and Dark Horse’s 4 Elf – since the 4Elf is so much darker. 12 Dogs took this round 17 to 16.5. Our tasting notes are below if you’re interested. An Anchor Christmas Ad from 2008, to give you a sense of scale. Very clear copper color with an off-white head. Smells of ginger, cinnamon, and honey. Ginger stands out, but not apart. Very much what we expect in a Christmas Ale. Spices up front and center. Again mostly ginger and cinnamon. Sweet and malty early on, but quickly gets bitter. Long finish, spicy and bitter but not entirely dry. As it warms, the malt gets more intense. Medium-full body, medium carbonation. Slightly warming. Very much in the Great Lakes Christmas Ale mold, but maltier. Nicely done. Dark brown and opaque, with a tan head. Anise and grape (raisin?) in the nose, along with chocolate and some other spicing. Darker-smelling than typical. As it warms, the chocolate comes out much more strongly, and Erin gets a little coconut. Significantly more roastiness and chocolate on the taste. Still highly spiced, though. Medium body, medium carbonation. I get a distinct alcoholic warming as it goes down. A different take on the style, but nicely done. This match-up is a lot more difficult than I would have expected. This last bracket was one of the toughest of all. 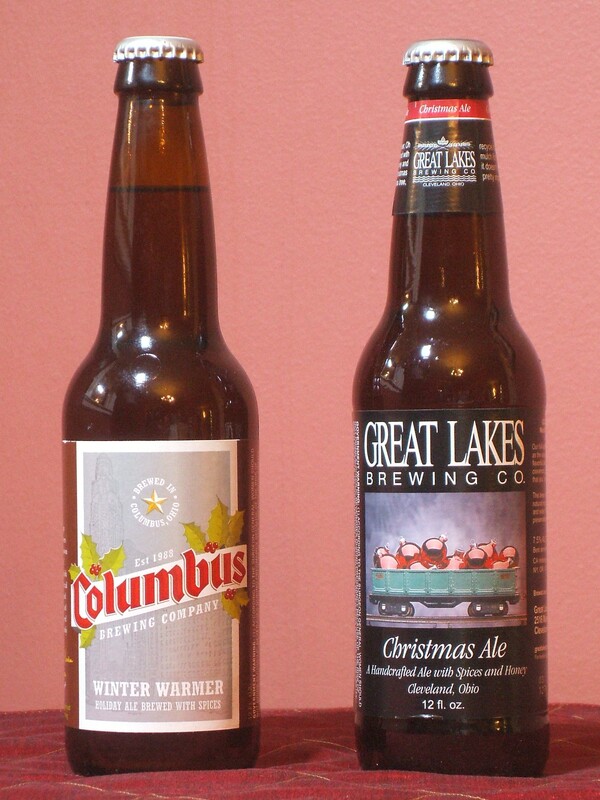 A venerable contender – Great Lakes Christmas Ale – goes up against a hometown favorite – Columbus Brewing Company’s Winter Warmer. Copper-colored and very clear, with a small, off-white head. Ginger and cinnamon in the nose, maybe some honey. All quite restrained, though. Otherwise, there’s some caramel maltiness and maybe a touch of chocolate that comes out as the beer warms. Medium-bodied, with medium or medium-light carbonation. No astringency. Lightly warming. Very drinkable. Copper-colored, somewhat cloudy, with a small, off-white head. Very similar in color to the Great Lakes, though cloudier. Moderately strong Christmas spice in the nose. Smells like cinnamon-spice cookies–mmmm. Cinnamon stands out the most–a touch too much, for Josh’s taste–with maybe some nutmeg and ginger as well? The ginger comes out more as the beer warms. The spices are strong enough to crowd out most of the malt. Stronger spicing in the mouth than the Great Lakes. Again, more cinnamon-focused. Fairly restrained for a Christmas ale. Moderate sweetness, but moderate bitterness too. The finish dries out somewhat but not entirely, though either hops or spices seem to add some late bitterness that the Great Lakes doesn’t have. Medium body, with somewhat higher than medium carbonation. No astringency. Lightly warming. All in all, a very nice Christmas ale. I suspect this would have won at least one of the other brackets. Unfortunately, it’s got some stiff competition here, and this one isn’t quite as polished as as GLBC. The flavors don’t meld quite as well, it’s rather cloudy, and I’d like a slightly drier finish. Ultimately, these are just quibbles. Nice job, CBC. Great Lakes wins by a nose! Or maybe it was appearance? Our goal is to run the semi-finals over the weekend and take a few bottles of the finalists to the family Christmas party and get votes for the winner, so I’m keeping the two remaining Ohio beers in separate contests and stacking up the more established breweries against each other. As expected, last week’s dip was not reflective of general trend. Or, with all the snow we’ve had lately, I haven’t gotten outside to run as much. I’ve been using the elliptical I have at home, but could tell that was not as effective. I finally caved this past weekend and drove all the way to OSU to use the fancy gym (“RPAC”) to which I thought I was a member, only to find out that my membership was supposedly stopped in July. Kids at the front desk (okay, technically adults, but college students look like kids to me) told me there was some error, clicked some buttons on the computer, and I should be good to go. So, I went in and ran on the 1/8 mile indoor track. I had dressed for cold, but it was so warm I thought I would pass out. I averaged 11:54/mile, and was bummed since I was averaging 11:15 in November. Yesterday, it was snowing, so I went back to to the RPAC and once again — no dice. I was having a low blood sugar moment and nearly had a melt down when the kid swiped my card, waved me through, and then I crashed to a halt at the turnstyle. It hurt. I was annoyed and embarrassed. The kids at the front desk tell me this time that the membership was a yearly renewal, so my membership really was cancelled. They offered to put me on a monthly membership, but I thought, “If I haven’t come here since July is this worth my money?” I also thought, “My thigh hurts from banging into that turnstyle. I had to park 1/4 mile away and walk here through the snow. I’m hungry. This blows.” So I said I’d need to think about it with as much grace as I could muster (which was about this much ) and left. Today was sunny and snow free, so I ran a 5K outside. I averaged 11:21/mile for the run, with 11:10s on the second and third mile. Go me! I like being out doors so much more than running inside. It’s below freezing, and though I didn’t feel like taking off my hat, I enjoyed the run. We’ve even been getting bursts of sun. 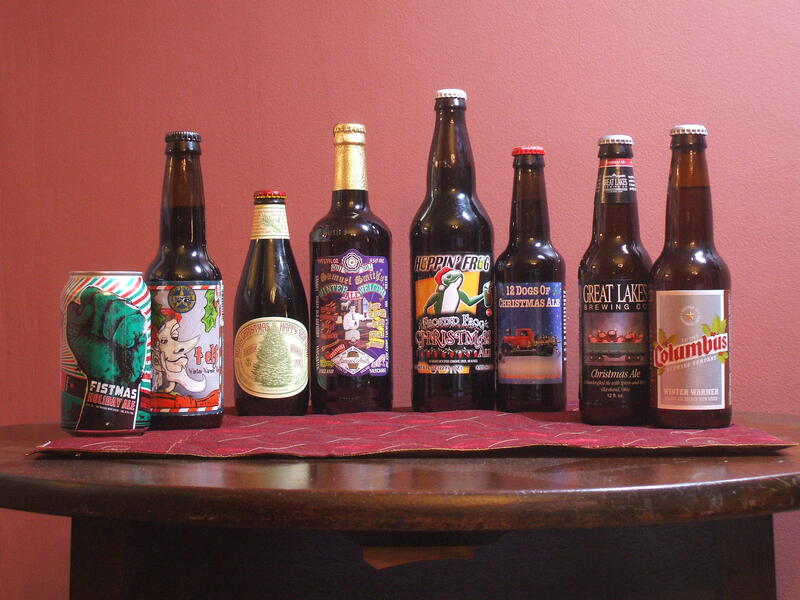 It’s time for the third regional of our Winter beer competition, with an Akron face-off! Which animal – dogs or frogs – will advance to the next round? Pours a darkish copper with a medium, white head. Clear. Ginger comes through strong on the nose, with some Christmas spices in back. Very gingery taste as well, with stronger spices—cinnamon, nutmeg, maybe honey? Not quite as good a mix as the nose, in [Josh’s] opinion. Balanced malt, with a moderately dry finish. Moderately warming. Smooth. It’s 8.3%, but drinks like a 7, tops. A really nice Christmas ale. Deep, dark, reddish copper. Thin, off-white head. Clear. Huge spice nose. Cinnamon stands out, with ginger, nutmeg, and clove hanging around as well. Similar taste. Cinnamon throughout, but particularly on the finish. The spices are more balanced here than in the nose. Behind the spice, sort of an Oktoberfest feel—malty and rich. Overall, the beer falls a bit on the sweet side, but not overly so. The spicing is too strong for Josh’s taste. Erin likes it a lot, though, but says a snifter’s worth would be enough. Definitely warming. You can tell this one is a high-alcohol beer (8.6%). One for sharing; the 22-oz. bottle this came in is far too much to drink by oneself. Great smell, but a bit overwhelming. Taken back a few notches, this would be a wonderful beer. 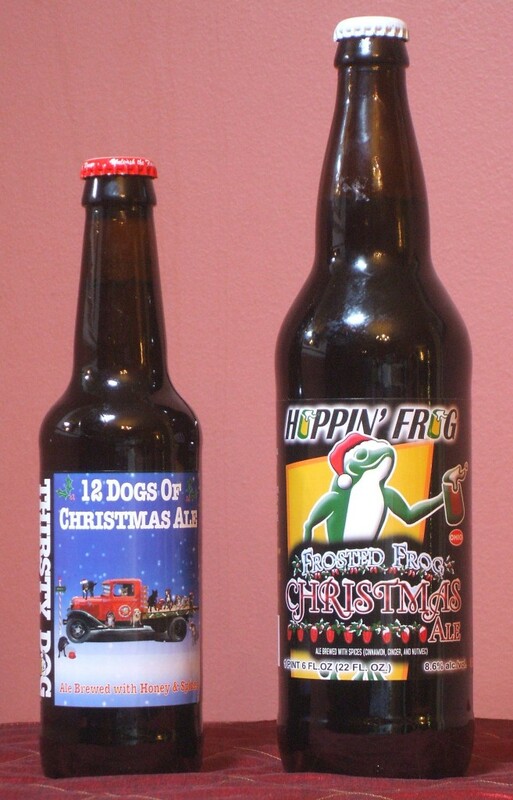 Our winner: 12 Dogs with an overall score of 17 to Hoppin’ Frog’s 15.5. I liked the Frosted Frog much more than Josh, but it must be meant for sharing. I can see it being a fun pick to bring to a holiday party. This ended up being an unfair match-up since it turned out Josh had picked up a 2011-2012 Samuel Smith’s Winter Welcome. The ale held up well for a 2 year old, 6% alcohol, beer, and if Josh hadn’t been pulling so hard for its competitor, Anchor Steam’s Christmas Ale, it might have advanced. We’re considering a rematch with the current batch of the Winter Welcome. 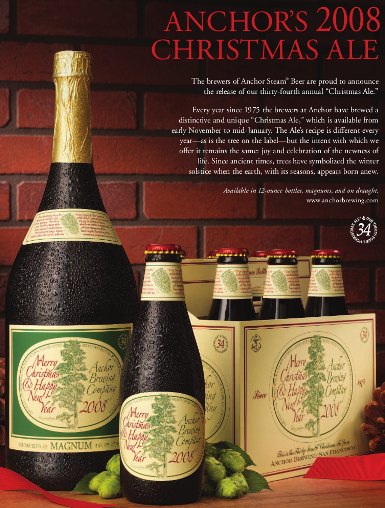 This round’s winner: Anchor Brewing, Our Special Ale 2013 with 16/20 points. Dark brown in color with some reddish tones and a largish, khaki-colored head. Nice lacing. The spice tones down on the taste, letting some dark maltiness through. Dry finish. Very nice. Really good spiced Christmas beer. My favorite of the Anchor vintages I recall. Light copper in color. Very clear. Medium-sized white head. Smells strongly of malt–bready, mostly–with some earthy hops. No spice, as far as I can tell. A bit of butterscotch comes out as the beer warms. Malty taste as well. A bit sweet up front, with some light fruity tones, though the beer seems to get drier as it warms. Dries out somewhat, but not completely, on the finish. Medium body and medium carbonation. No astringency. Quite drinkable. A nice winter warmer, but unfortunately the lack of spice doesn’t really fit with our theme here. I wish it had either more malt or less sweetness; as it is, it kind of fits between two beers that I wish it was. It feels very British in that way: not going far enough, out of a worry of offending. (Barleywines notwithstanding.) All in all, it’s good, but doesn’t do much to stand out. Stephen Fry as the Master of Laketown. It’s been 20 years since I read the Hobbit, so pretty much all I remember is Gandalf, Dwarves, Bilbo, Eagles. Wednesday Weigh-in: Maybe a Fluke? My numbers this week seem a bit off given my intake and activity levels. 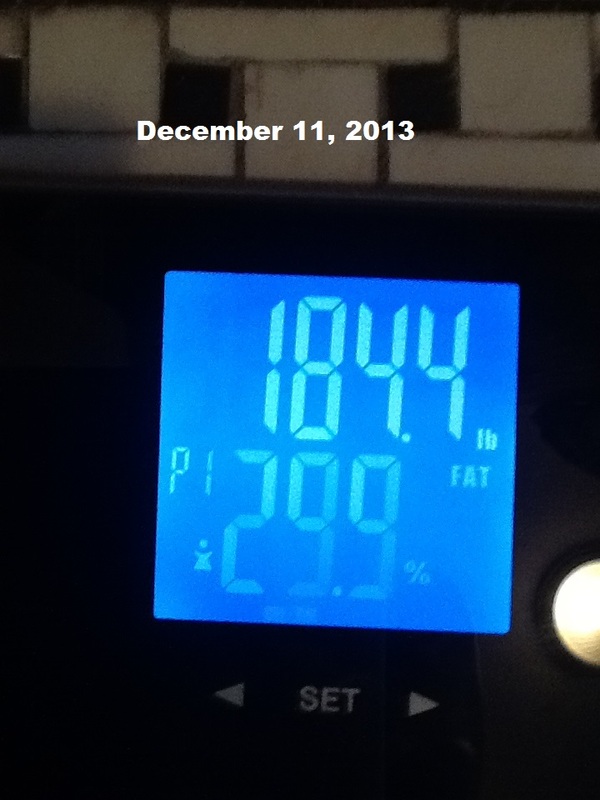 I suspect some water loss may be playing into this week’s weigh-in. 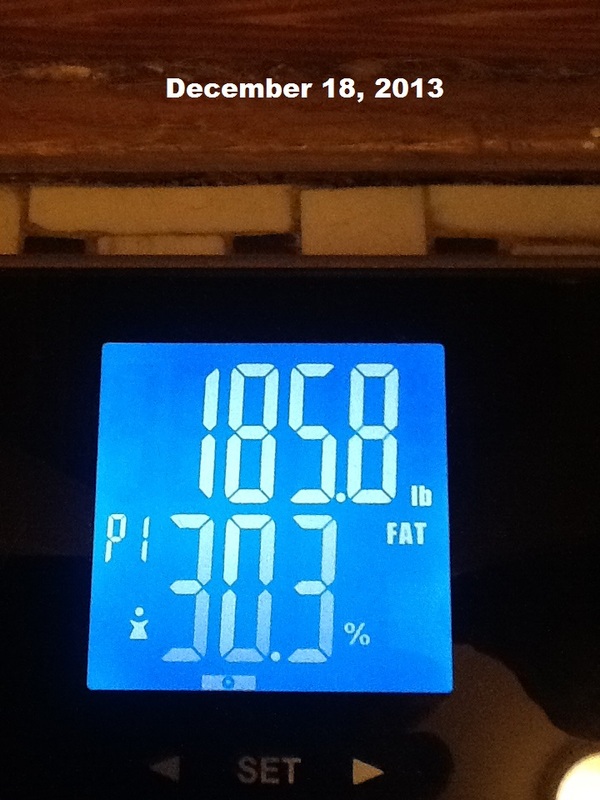 My scale says I’m down 1.6 lbs from last week and almost a full percentage of body fat. Now, I’ve been following my Novice 5K plan and did the 30 Day Shred Level One on Monday (rest day from running), but I don’t think 20 minutes of aerobics with some weights is going to move the scale that fast! you would have bought the thing in the first place. Simple, right? Everybody gets this, no? Well, of course not, because coupons are there to make us buy things we might not have bought in the first place. Here’s a list of 50 brands this discount doesn’t apply to, and every nice, expensive item in this store is on this list of excluded items. Perhaps you would like some plastic mixing bowls or scratchy towels? If so, you might find a brand to suit, but let’s just forget about kitchen electronics or designer bedding, shall we? I like to picture Loki from the Thor movies delivering this message. So, BB&B, I am done with you. Unless you send me Loki. In that case, we can be BFFs. I asked Josh to stop and pick up some holiday beers to try as a fun, Friday evening activity. And did he ever pick up some beer. I was expecting three or four beers, but we had eight. What to do? Enter, the Xmas Beer Bracket. 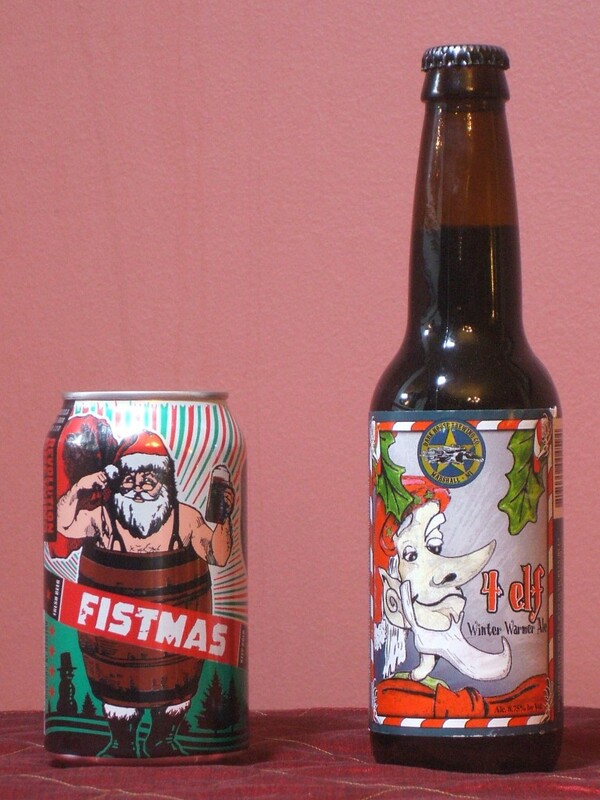 Over the next week, we will pair two beers at a time, in three rounds to determine the 2013 Xmas Beer Champion. These were two very different beers both from breweries that I like and respect, though neither one was a slam dunk for me. Josh, as is his usual practice, took notes on the beers and I gave my feedback on appearance, aroma, taste and my overall preferences. The notes below are mostly his, with a little bit of editing from me. We tend to consider beers along the lines of the Beer Judge Certification Program criteria: aroma, appearance, flavor, mouth feel, and overall impression. Copper, clear, med. khaki head. Strong, hoppy nose of pine and spruce, with some citrus as it warms. Some malt, but light. Tastes more malty than it smells, though the bitterness holds its own. Still some pine, with something else that I don’t really dig. Medium body and carbonation. Not really warming. No astringency, but not particularly dry on the finish either. An interesting take on the style, pushing piney hoppiness and leaving the spicing to play a supporting role (unless some of the spicing is from spruce or something, which wouldn’t surprise me). Not really my thing, though. Dark brown, somewhat cloudy and pretty much opaque, with a small tan head. Spicy nose: molasses, clove, gingerbread. Roasty malt hanging back. Heavy spice taste. Clove, cinnamon, maybe nutmeg. Medium body and carbonation. A bit warming as it goes down, but not as much as one would expect, given the alcohol. Nice dry finish, but with a touch of astringency. More towards a traditional, dark winter warmer, but perhaps a bit more fortifying than the average. I’d prefer a bit less spicing, but Dark Horse again does a great job making a high-alcohol beer seem significantly less so. Winner of the first bracket: 4 Elf with a cumulative 15/20. Congratulations, 4Elf. 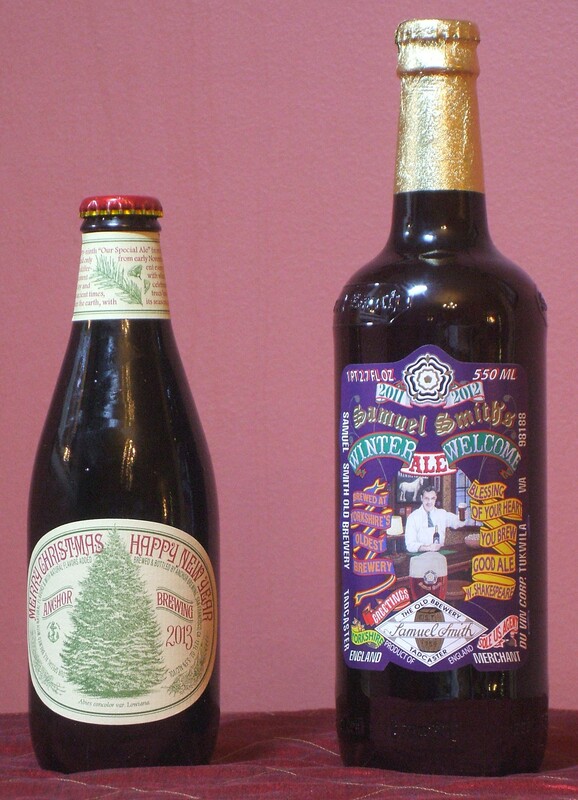 You will be facing off against the winner of our upcoming Distant Shores Bracket: Anchor Steam’s Christmas Ale v. Samuel Smith’s Winter Welcome Ale.